Dahlias make excellent cut flowers because their stems are long and their blooms last several days in water. To keep your vases full from late summer till fall, we've assembled a cutting garden mix you'll never forget. It contains a range of colors, shapes, and heights. Dahlias aren't hurt by cutting. In fact, the more you cut, the more these prolific plants will grow and bloom. Each mix contains 6 tubers, our choice, not labeled. Dahlias prefer full sun, though partial shade is acceptable. They like rich soil and even moisture, which means regular watering in areas with hot, dry summers. Dahlias are perennial in Zones 8–10. Where they are not hardy, Dahlias are easily overwintered indoors. 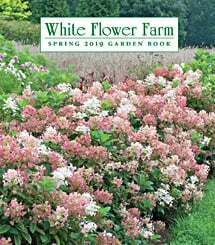 White Flower Farm delivered the product in great condition within a reasonable amount of time from the time I placed the order. I do wished the different varieties would have given the name of each flower so I could have planted them according to height. I bought this assuming I would get a diverse range of colors in the selection. This tubers I received produced almost all red flowers (in different sizes and shapes of blooms), and one yellow variety. Definitely not what I expected.